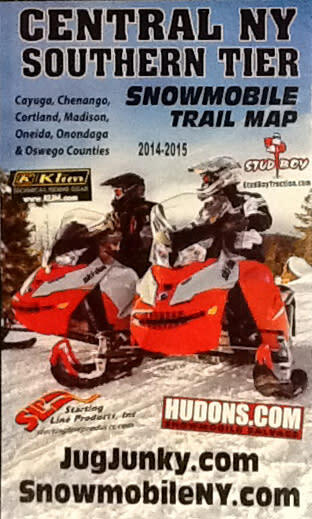 December 22, 2014, Cayuga County, NY –Snowmobile weather will soon be here and the 2014-2015 Snowmobile Trail Map for Central New York and the Southern Tier is available at the Cayuga County Office of Tourism to guide snowmobilers throughout the region. The map features trails from Pulaski to Moravia to Whitney Point and everywhere in between. Cayuga, Chenango, Cortland, Madison, Oneida, Onondaga, & Oswego County trails are all included in this full color foldout map. In addition to a great map, snowmobilers will find information on where to get parts and repairs, snowmobile rentals, lodging and dining near the trails and local snowmobile dealers. Maps are $5.00 and are available at the Cayuga County Office of Tourism, 131 Genesee Street, Auburn, open Monday-Friday, 9 a.m.- 5:00 p.m. (except Christmas and New Year’s days).